The Ricoh 500SE GPS-enabled camera is a rugged (dust-proof and waterproof) 8-megapixel model with a wide 28mm to 85mm (equivalent) zoom lens, 2.5" LCD monitor, supports both Bluetooth and WiFi networking... oh, and has built-in GPS hardware and software. 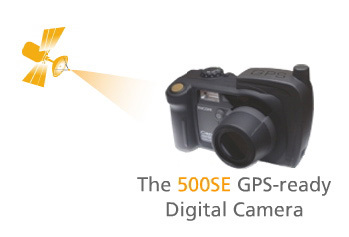 The camera's integrated GPS module provides for geo-coding images and video at the time of capture. For applications that require even greater precision, the camera is capable of receiving NMEA data streams from external GPS devices via its on-board Bluetooth radio. Once the captured geo-image files are transferred to a computer, they can be converted to shape files or merged into geo-databases for instant integration into Geographic Information Systems (GIS). Points representing each file's position may be hovered over to display a thumbnail of the file, or clicked on to access the original image or video. Although I don't have confirmation from Ricoh, it appears that the 500SE is both Mac and PC compatible. It's not cheap, however. The 500SE will set you back around $1,200 US with all the bells and whistles. I hope to get a hands-on look at it during the PMA show this coming March.